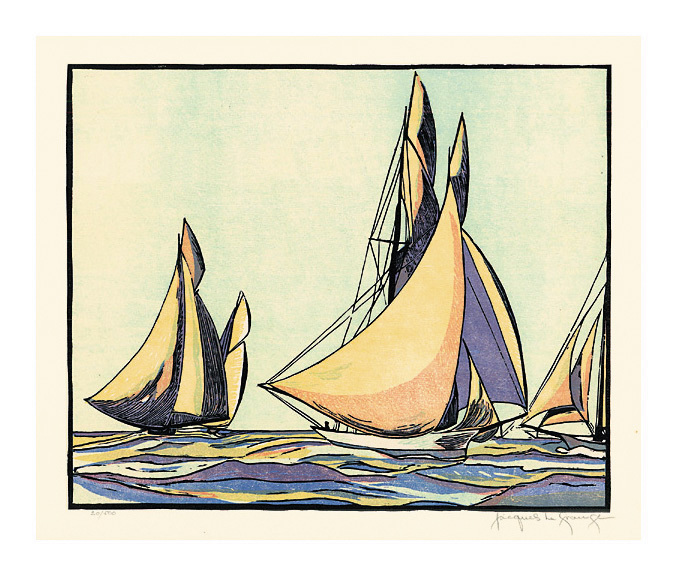 The Endeavour, 1934-- 1934, Color Woodcut. Edition 500. Signed and numbered 20/500 in pencil. Image size 10 3/16 x 10 5/16 inches (259 x 262 mm); sheet size 12 1/4 x 15 inches (311 x 381 mm). 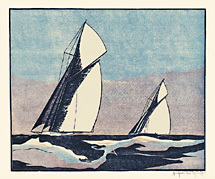 A fine impression, with fresh colors, on cream wove paper, with full margins (5/8 to 3 7/8 inches), in excellent condition. 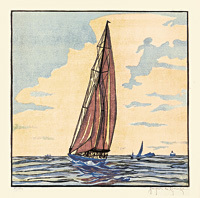 From La Grange's series Drama and Color in the America's Cup Races. 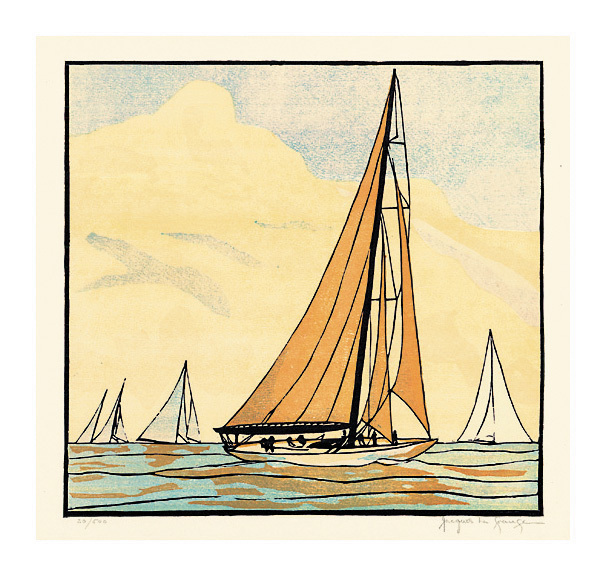 Columbia Passes Shamrock II -- 1934, Color Woodcut. Image size 5 5/8 x 6 3/4 inches (143 x 171 mm); sheet size 8 13/16 x 8 3/16 inches (224 x 208 mm). 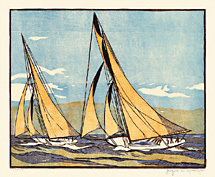 A fine impression, with fresh colors, on cream wove paper, with margins (1/2 to 2 1/8 inches), in excellent condition. 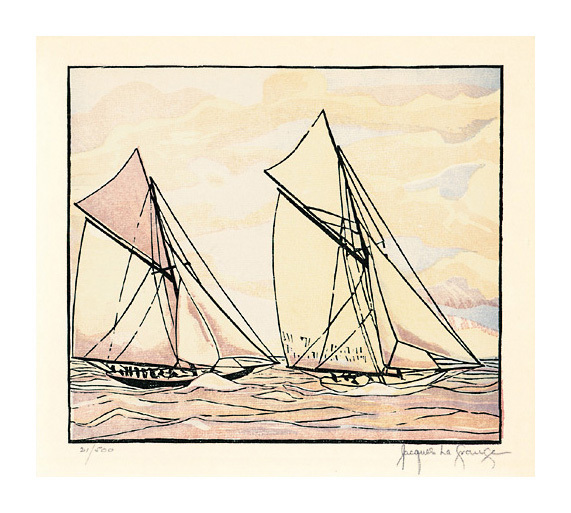 Racing in a Storm -- 1934, Color Woodcut. 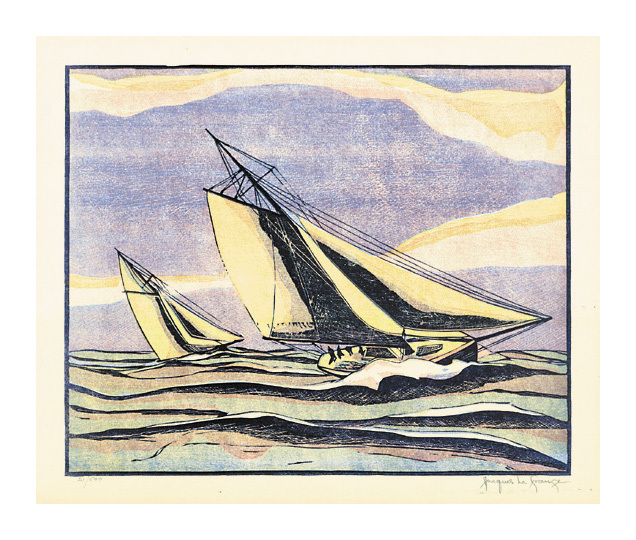 Sappho Passes Livonia -- 1934, Color Woodcut. 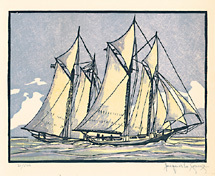 The Magic is Ahead, 1870 -- 1934, Color Woodcut. Image size 9 3/4 x 12 1/16 inches (248 x 306 mm); sheet size 12 x 15 inches (305 x 381 mm). 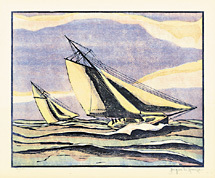 A fine impression, with fresh colors, on cream wove paper, with margins (1 1/8 to 1 5/8 inches), in excellent condition. 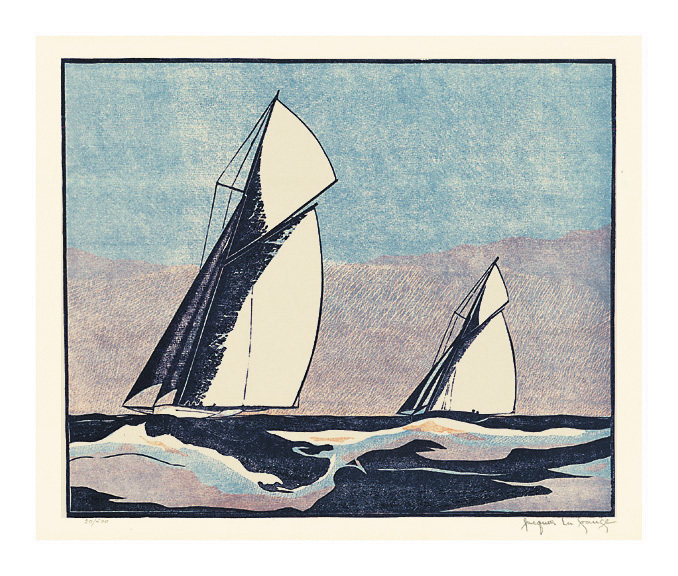 The Yankee, 1934 -- 1934, Color Woodcut. Image size 10 x 10 11/16 inches (254 x 271 mm); sheet size 12 x 15 inches (305 x 381 mm). 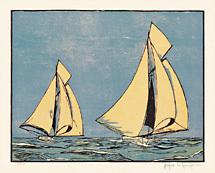 A fine impression, with fresh colors, on cream wove paper, with margins (1 to 3 inches), in excellent condition. 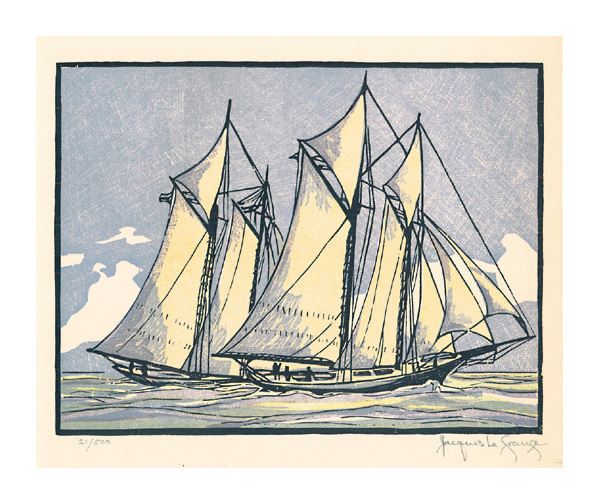 Volunteer Outsails Thistle, 1887 -- 1934, Color Woodcut. Image size 10 1/2 x 12 13/16 inches (267 x 325 mm); sheet size 12 x 15 inches (305 x 381 mm). 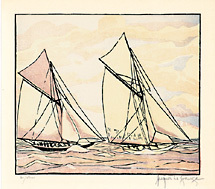 A fine impression, with fresh colors, on cream wove paper, with margins (3/4 to 1 inch), in excellent condition. 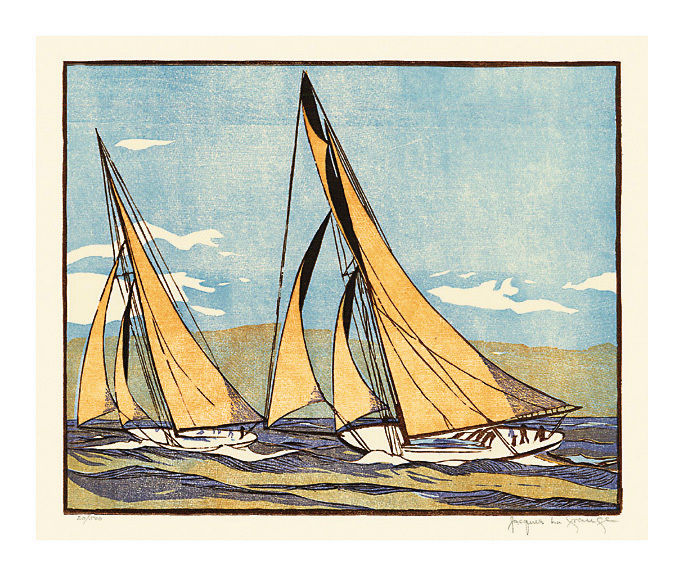 The Start of the Race, 1899 -- 1934, Color Woodcut. Image size 9 5/8 x 12 inches (244 x 305 mm); sheet size 12 x 15 inches (305 x 381 mm). 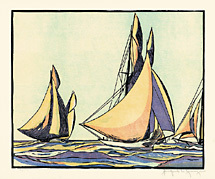 A fine impression, with fresh colors, on cream wove paper, with margins (1 1/4 to 1 5/8 inch), in excellent condition. 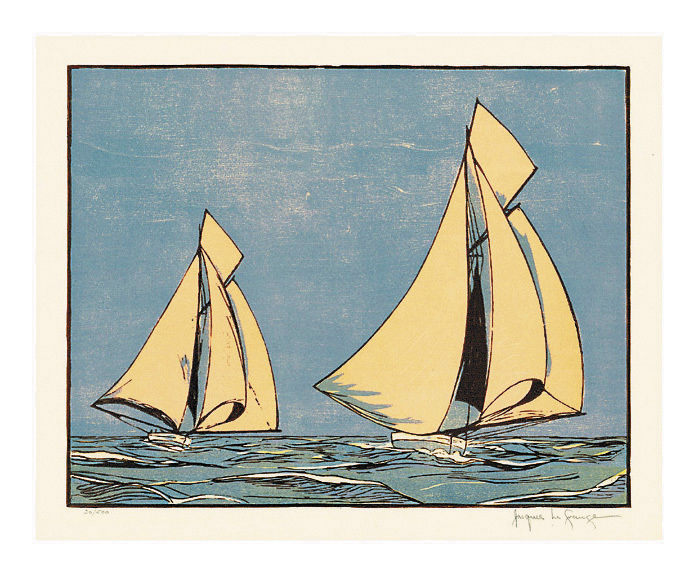 Mayflower in the Lead, 1886 -- 1934, Color Woodcut. Image size 9 3/8 x 12 1/8 inches (238 x 308 mm); sheet size 12 x 15 inches (305 x 381 mm). 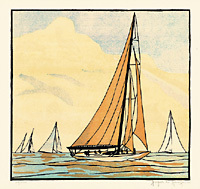 A fine impression, with fresh colors, on cream wove paper, with margins (1 1/4 to 1 1/2 inch), in excellent condition.